Tommy and I bolted down the hallways of the school, following the notorious Vernon O’Brian. After his Bounty Hunter-scandal, Tommy was more determined than ever to catch him and bring him to justice. (Well, to Principal Howell, at least). Vernon’s shoes squeaked as he nimbly dodged the other students, making his way into the art room. There, he had set up a HUGE water bomb, which would cost McQuarrie hundreds of dollars to repair should it go off! I tried to keep up, but I’ve never been much of a runner. Sucking in my gut, I plowed ahead past the other students–if you read this, sorry about knocking over your homework, Lance–and we cornered Vernon, who slipped on a banana peel left over from lunch, and fell into his locker. A ton of stuff fell on top of him. Bo-bag Fetts, Deng-arts, IG-Mach88s, you name it. While Vernon recovered, I wrote all of this stuff down, and I prepared to write down his confession. “I got this from an old auction back home,” Vernon said. He grabbed something else from his locker: a Western-style pistol. He pointed it straight at Tommy. “Hasta luego, Lomax!” He fired. Tommy held his stomach in pain, and fell to the floor. I glared at Vernon. After his punishment, Tommy and I were still suspicious that Vernon was planning something. But with all of his Bounty Hunter lackies transferred away to other schools, he didn’t have any means with which to “take over the school, MWAHAHA,” or anything. I walked outside of the theater, and picked up one of the fliers for the performance. Origami Yoda and the Bounty Hunters. Mr. Howell was apparently really impressed with how we dealt with the vandals (I didn’t even know he COULD show any emotion besides anger), so he authorized a script—written by Holocron Keeper Mike—for an Origami Yoda musical drama! It went through our sixth and seventh grade years through a couple music numbers, but the main plot of the story was when the Bounty Hunters began vandalizing the school. Starting with Jango Fortune, we went through each of our eighth grade case files, to find the subjects and characters that would be used in the story. Vernon got to play himself—which was kind of embarrassing for him, being considered the big baddie and all—but pretty much all of the students get to play their own parts. Well, except for Harvey. He got into some trouble during Home EC last week, so his role was changed into—guess who?—Harold Hummer! “NOOOO!!! !” Harvey cried at the time. I got to play myself, and actually, thanks to an AWESOME plot twist from Mike, I’m the main character! At first you watch the show and you think, oh yeah, Tommy is the main character…but then, Vernon shoots Tommy, and I become sort of the main character for the rest of the story! Totally Stooktacular! “Admiring my work?” Someone asked from behind me. Rhondella. “YOUR work?” I looked at her quizzically. “I made the fliers, see?” She snatched the paper from me and turned it over, pointing to the very bottom of the last page. Fliers arranged and distributed by Rhondella Carrasquillo. “Good job,” I said flatly. I began walking away, my heart pounding like a drum. I didn’t even like Rhondella anymore, but I still get all antsy around her. “Kellen, wait up!” Rhondella walked over to me, putting her hand on my shoulder. I resisted the urge to shake her hand off of me, when she spoke. A couple moments of silence. I was kinda stunned. “So you’re saying…you want us to still be friends?” I asked, my heart lifting. She smiled. “Sure. That would be awesome.” She hugged me, and just as quickly walked away. Maybe this would be really healthy for us, being friends again. But oh man…how am I gonna explain all this to Remi?? Tommy’s Comment: Dude, it’s okay. I showed this chapter to Remi, and she completely understands. She was actually pretty amazed that you immediately thought about her after that experience. You’re all clear, kid! Harvey’s Comment: Not only did I get casted as Harold Hummer, but they actually DELETED the role of Harvey!! They said my role wasn’t critical to the plot! Ugh! It started like any normal day at McQuarrie. Well, okay, not normal, but y’know. I was in the library reading this book called “Stonewall Hinkleman and the Battle of Bull Run,” when it happened. As he said this, he took out something out of a bag. It was paper’s worst fear… water balloons. But not just any water balloons; water balloons with Jango Fett’s mask drawn on them with a black Sharpie marker. “Don’t test me, cause if you do…let’s just say I’m a crack shot,” he chuckled. Everyone backed out of the room, even the librarian. That is, everyone except me. I ran behind a book shelf, and took Han Foldo and the Fortune Wookiee out of my pockets. I was worried for the books, and right then I needed some courage. I thought to myself, and remembered what I told so many of the kids who asked Origami Chewbacca questions… Are you a wimp, or are you a Wookiee?? “Greater good or not, you’re going down!” I said. I grabbed one of his Jango water balloons as evidence and zoomed out of the library. I ran until I got to the Science classroom. “Sara, where have you been?” said Tommy, who was passing by. “I… Found… This,” I said while panting. “Here, I’ll explain it to you,” I replied. After I drank some water and rested a bit, I explained the whole thing to Tommy, and gave him the water balloon. “Thanks Sara. This might help my new case file a lot,” he said. “You’re making another one about the Bounty Hunters?” I asked. Kellen’s Comment: Drat! I tried looking for the Star Wars Visual Dictionary, but it’s gone! Mrs. Calhoun said that all the Star Wars and origami books got ruined, and Sara was too late. What do we do now?? Harvey’s Comment: Celebrate that we won’t have anymore paperwads at school…..? Just a suggestion. Our First Lego League competition, which is a Lego Robotics contest, had finally come! Sara, Tommy, and I had been working hard on our lego robot for the contest. We designed it after R2-D2, and like him, he has two small hands that can hold stuff and press buttons! We call him L8G0-D2 (pronounced LEGO-DEE-TOO), and I was expecting that he was going to win. That is, until Cut Bane, Sockuss, and his robot, Jaws 1.5 entered the competition. It was the day before the Lego Robotics contest. Our team name was the Rebels, and our robot had to do several tasks that had to do with working on the Moon. In our pre-championship test game, we had gained 450 points so far and we were in first place. But then this kid named Xavier had his turn. I hate to admit this, but his robot was really good. It did most of the challenges perfectly. And he got a score of 470! After he finished, Xavier came over to talk to us. I was going to say “most impressive!” But Tommy didn’t think so. I wanted to pulverize him right there and then, but Sara pulled me back. Near the end of the real competition the next day, we were tied at 900, and it was our last turn. We were doing SPECTACULAR, when suddenly the robot started to spin around in circles. We didn’t know what to do. Then I remembered something. Earlier that day, when Tommy, Sara, and I went to get a drink of water, we left the robot by the computer. Anyone could have walked over to sabotage L8G0-D2! Xavier and his team won first place, and we got second place. I guess that’s okay, but I was still pretty mad. Not at Xavier, but at Tommy. The next day, I found two things taped to my locker. One was a sock, but it was drawn with a Sharpie in order to look Zuckuss, a Star Wars bounty hunter. It had a note on it. And the other thing was—oh goodie—Cut Bane. A kirigami Bounty Hunter. Vernon walked past me in the hall, and caught sight of Cut Bane. His eyes widened, and he dashed away into the crowd silently. Tommy’s Comment: This guy IS bad, Vernon or not! But why would a bounty hunter try beating us in a FLL competition? Library books, Legos, origami—okay, that’s already kinda weird. But sabotaging and endangering the life of a cute little bunny?? That’s just cold. I suppose we’ve told you guys about Hendricks, our super sweet class pet bunny rabbit from music class? Well yesterday, we couldn’t find him. Mrs. Johnson didn’t see Hendricks in his cage, which we’d set up carefully next to the closely guarded CD that included our music for the Origami Yoda musical, and even though she told us all not to panic, I panicked. I went over to Dwight, who took the same class as me, and asked Origami Yoda for advice instinctively. I went back into my classroom, searching Hendricks. You remember Sadie, that girl from my church? She was in that class too. I still hadn’t really gotten to talk to her or anything yet. But apparently, Harvey’s friend Isabel Jones had. They were fast friends, I guess. So Isabel helped us out, and all three of us looked for Hendricks all around the school together. Kind of like a really weird girls night out. Finally, we heard a high pitched shriek from the locker room next to us. We bursted into the room, and all held our sides from laughing so hard. Harvey—dressed in a bath towel—was utterly horrified by the awful terror of little Hendricks, who was licking his feet. Isabel picked up Hendricks, cooed and snuggled with him for a bit, and took him back to his cage. Sadie and I had finally bonded—just like Origami Yoda said about rejoicing—and Hendricks was safe. But the CD wasn’t. In all of our frantic searching for Hendricks, somebody took the CD for the musical, and in its place was a Cut Bane puppet. Oh great. The only thing I was still trying to figure out…who unlocked Hendricks’ cage in the first place? Who wielded Cut Bane? Tommy’s Comment: I think I can answer Sara’s question… Because I think I know who unlocked Hendricks’ cage, and ruined the library books, and sabotaged the Lego contest, AND the one person who could truly be considered “Yoda’s Bane” from the prophecy! Harvey’s Comment: Dude. It’s Vernon. That’s obvious. Can I please just go and catch him in the act? Tommy’s Other Comment: Uhh…okay. By all means, do that. But Vernon is gonna be doing the Origami Yoda musical with us tonight. I mean, if he tries to mess up the show, you can stop him, but I think Vernon’s probably smarter than to vandalize the school in front of a huge audience of parents. Harvey’s Other Comment: Whatever. On a side-note, anyone else noticing how dull and boring this is anymore? I mean, there’s barely any mystery left in these mysteries! It’s always the new kid’s fault, or the old bully, or whatever. There’s no big shocking bad guy reveal or anything. It’s just shoddy. That’s all I have to say about it. And in five minutes, I’ll have this case file wrapped up, sent to Mr. Howell, and have Vernon transferred out of here forever. Just watch. Or, uh, read. Finally, after all of our preparation on this musical, it’s all coming together! Arnold got the lights into position, Jack took his position by the doors to give out our pamphlets, and the actors and I were all getting our costumes on backstage. Just as I was putting the finishing touches on my wig for the first song, I bumped into Vernon. I chuckled nervously, but Vernon assumed it was in good nature. “Well, Tommy,” he said. “I think it’s time we finally put all of this Bounty Hunting stuff behind us. Pals?” He reached his hand out to shake mine. I shook it. I know it felt a little weird, but maybe this whole thing really was over now. Vernon pulled me in close. “I have something REALLY IMPORTANT to tell you,” he whispered in my ear. It’s funny, it took me back to when he first whispered to me, “the map is the key,” when we first met last month. Boy, maybe we really just misjudged these guys. And even though they were punished for vandalizing, maybe now they’re happy at their new schools. Maybe they made some mistakes along the way. Heck, we did too. But tonight really was the night to show everybody that we’d all made amends. “Break a leg,” Vernon said. I instinctively winced, but then I understood what he was saying and smiled, as I walked out onto the stage for the first music number. For the whole first act of the play, everything went great! It was totally STOOKTASTIC!! The music—thanks to Mr. GoodCleanFun and Mrs. Rabbski super-quickly making a backup CD—was brilliantly executed, the costumes were perfect, the actors were great—even Harvey as Harold Hummer—and Vernon…well….. Even he did an excellent job! Y’know, Harvey, I have no idea what you were so worried about! I’m sorry, but this is just pathetic. Once again, Tommy’s been fooled by the misdirection of a mad genius kid. As we took our intermission, I followed the sound of Vernon’s squeaking boots to the prop closet. And what do you know? Vernon was standing in the prop closet, wearing that Jango Fett voice changer Sara saw. And he also had something in his backpack that looked like… oh great. One of those Fourth of July smoke bomb-thingies. He saw me and gave me an evil grin, then sprinted off. I knew what I had to do. I chased Vernon through the theater, dodging students, teachers, and a grilled cheese sandwich. On a side note, hey, who threw that?? I walked down the stairs to the basement. I saw light and noises coming from one part of the large, eerily quiet room. I sneaked towards that area to see Vernon messing with the air conditioner machine. Around him was OUR Lego robot, who was holding our musical CD that was lost! Vernon must’ve been trying to frame us, too! “Gotcha!” I said, locking my arm around his neck. “Huh?” he said with surprise. His voice was completely masked by the voice-changer. I’m really starting to hate those things. “What are you doing?” I screeched into his ear. Well, his ear-area. I hadn’t gotten his helmet off of his head yet. He lit the smoke bomb-thingy, and blue-ish white smoke blew into the air conditioner machine, fanning it throughout the school. The fire alarms blared ahead, and…oh no…. I was drenched in seconds, thanks to the automatic sprinklers installed in the school ceilings. Vernon lit a second smoke bomb, and this one fogged up my glasses, making it virtually impossible to see anything. When the smoke lifted, he was gone. Alone, I whipped out my iPhone from my pocket. The front camera had been peeking out of my pocket the whole time. I caught everything on tape, to prove what he had done. But what I HADN’T proved was that the Jango kid was Vernon. I still had to do that. The smoke began rising onto the stage, which worried me. Had there been a fire? Harvey ran up to me, panting. “Dude, you’ve got to believe me…” He paused, looking behind me. “What?” I said. I turned around, and saw Vernon looking around the floor for something. I began to walk over to help him, but Harvey put his arm in front of me. Harvey and I were silent, waiting for him to explain. Vernon pulled out a piece of paper that was taped to the inside of his hat. Before Vernon could explain more, the girl with the Jango helmet burst onto the stage. Vernon quickly slipped the piece of paper back into his hat, and bolted towards the girl. With the blue-ish white smoke rising, and a girl dressed as a Bounty Hunter coming on the stage, I guess all the adults thought it was part of the script. (Mike had been kinda big on making last-minute changes, so it wasn’t past the realm of possibility). Vernon chased the Jango girl, until she tripped over one of the microphone wires and fell into a HUGE IG-Mâch88 we decorated for the show. Covered in newspaper and glue, she waved her arms and kicked frantically to get out, and accidentally knocked her helmet off of her head. Before we could even register what she looked like, she pulled Vernon in front of her, reached into her pocket, put something in her mouth, and she and Vernon disappeared. Everybody gasped and applauded. I guess the show was over, because most of the parents stood up and gave a standing ovation. My dad, even though he was still sitting down, gave me a firm nod, signaling pride. Kellen and Rhondella went over to both the curtain ropes and closed the curtain. Looks like Kellen and Rhondella really have gotten over all of their awkward stuff. But anyway, Murky was right. With a secret Bounty Hunter in our school, and without Vernon to help us, we probably still had a lot of work to do…..
After the show, we were all helping Janitor Phil clean up the theater. Harvey was whining about how he was barely in the first act, and the Quadruplets weren’t even IN the first act, so all of their hard work was as good as wasted. But I wasn’t complaining. At the very least, our work proved Vernon was innocent. And even though we weren’t sure how trustworthy of an ally he was, we all knew that we had to find and help him. I was picking up some of the paper mâché stuff from our IG-88 prop, trying to throw it all away, when two pieces of paper slipped out from the bottom of IG. Vernon’s note and a Cut Bane. I picked the note up, and began reading it. On the top, Vernon wrote, “This was written by my mom. I kinda ripped this out of her journal….sorry). Lil’ Vern was born in Texas and lived there for most of his childhood. He moved to Virginia with us, and he didn’t like it a bit. He had always become the target of school bullies—even his own cousin Tony! Heh! I suppose I really am the better mother. Take that, sis!—And in middle school, it wasn’t any better. He kept yammering about some kid named Zack who kept bullying him, but when he heard of this—err—Paper Yoda puppet, he wanted to ask him advice about his troubles. I don’t personally think a silly puppet could do anything for him, but I mean, I guess that’s what some child therapists use, so it can’t be that bad. But Vernon came home in tears one day, because the kid with the Yoda puppet wouldn’t give him advice! He made up some lame excuse about baked beans or something! Because of the rough environments in the school, we moved Vernon to a private school, where he would be accepted and special. Tippett Academy. Oh, the teachers just loved Vernon! They wouldn’t stop gushing! It was such the perfect place for a boy like him! But then one day, Vernon began fuming in the car. I guess that kid with the Yoda puppet had also transferred schools, and all the attention was being taken away from Vernon! My poor wittle wuvable Vernie! And in the same month our car broke down, we had a house fire, and my husband broke his leg. With all the money we had been spending, Tippett Academy was out of the picture. So we sent Vernon back to McQuarrie. We thought that without that Yoda kid around, maybe Vernon would have a better time there. But by the time Vernon came back, guess who was also back?? That same infuriating kid! I tried calling up his mother, but she barely seemed able to carry a full conversation, much less raise a child. And oh, I also found out that this kid, Dwight, is being raised without a father figure. That would explain his attitude! Anyway, when Vernon got back to McQuarrie, Dwight was causing this full-blown rebellion or something! Vernon didn’t take any part in these horrible activities, but he did try and report the students to Principal Rabbski. But instead of actually listening to him, Rabbski practically shut him out! “I’m very busy right now, Vernon? ?” What kind of lame excuse is that? This boy is subject to bullying and torment! Doesn’t anybody care??? Finally, my daughter Vanessa tried to help. I don’t know who she talked to or what she said, but apparently somebody “wise” told her to start a club that petitioned against McQuarrie’s unfair treating of students, as well as their learning! McQuarrie was stifling their creativity!! I was so proud of my two children, making this club together. But slowly, Vanessa began complaining about the club, and how Vernon had changed and ruined it. She called Vernon a “vandal.” Can you believe that?? My poor innocent Vernie, a vandal? I grounded Vanessa for a month because of that. (Though she still tried to hang out with some guy…. I kinda liked that kid. He was kinda sensitive and wasn’t afraid to cry, just like Vernon). But Vernon and his new friend…um…. I forget her name, but she and Vernon had become really good friends. (Maybe more than friends? That would be really good for Vernon’s self-esteem issues). But she and him would hang out all the time, and they even made their own little Star Trek puppets (Harvey’s note: STAR WARS!!!) of “The Banes,” I guess they were. There was Cut Bane, and um… Something else, but I don’t remember the name. But now, Vernon is getting community service as a punishment? What?? This whole school system is outrageous and unfair! Maybe I should be the one making the rebellion….. I’m gonna make some calls. Harvey’s Comment: Please excuse me while I puke when I read words like, “wittle wuvable Vernie….” BLURGHELOPLAAARRRGHHHHH!!!! Tommy’s Comment: Agreed! But now we know a little more about what’s going on with Vernon. 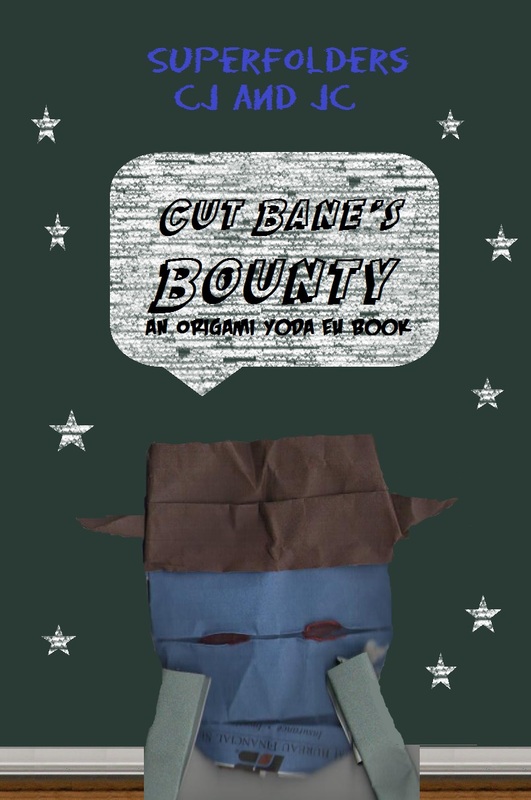 But we still don’t know exactly WHAT Cut Bane’s Bounty is. The next morning, it was dark and damp outside. The sky was grey and cloudy. And the worst part was that we—the McQuarrie students—were all stuck standing outside of the school, in the cold, all itching to figure out what was going on, and why we couldn’t go inside the school. “Do you love her?” Remi asked. The question hung in the air a few moments. Apparently, I wasn’t fast enough to reply, because Remi’s eyes began watering, and she began walking away. I felt like running after her, but I knew that wouldn’t really help anything. I mean, Rhondella and I….we’re….we’re….. I just don’t know. I like her a lot. But I also really like Remi. They’re both so different and both so cool…. Principal Howell stepped outside of the school, looking ghostly pale. In all my years messing with Mr. Howell, I’d never seen him look like this. The crowd of students hushed instantaneously. Mr. Howell walked down the couple steps, to our level. He sighed. “Due to our attempts to repair the incredible damage caused by the recent acts of vandalism in McQuarrie—the red and yellow paint on the lockers, the fire-protection sprinklers going off, the food fights and paintball guns—McQuarrie’s budget is at an all-time low. And if nothing changes…..” He gulped. In that moment, we finally grasped the true horror of Cut Bane’s Bounty. A plan that must’ve gone back to when Vernon felt bullied. Before Jango Fortune. Before the FunTime Menace. Maybe even before Darth Paper. Hey JC! Can you plz put me in the next chapter? That would be TOTALLY STOOKY PLASTIC PURPLE DINOSAURS! As you might see from my name, Im Xavier. And plz check out my blog ! Your role will be an interesting one…that’s for sure…. I guess because of this cliffhanger that in the next episode The Funpire Strikes Back!!! And I think I have figured out the Bane Vernon’s parnter has. And I think that Bane is YODA’S BANE!!! OMG this story is awesome! Also, will I be in the next one? And I hope everyone likes the origin for Vernon I came up with as SF HG. 🙂 Do you have any instructions for Cad Bane? Could use mine for the cover star please? Can the Quadruplets get a mention in the next story? That’s be great! anyone else notice the logo on his chin? THE LETTER SOUNDS LIKE DWIGHTS MOM! but i’me gonna have to agree with harvey. “my wuvable little vernie”? WOAH even re-reading this for the third time, that is one wild shocker/cliffhanger!